The Foursome story began in 1935 when a group of golf-playing school teachers decided to open a small general clothing store together. In 1955 Ron Engel and his wife Lucille became part-owners of The Foursome, Ron selling and Lucille doing bookkeeping and alterations. The business took on a true family flavor when their son Gordy — currently the company president —joined the business in 1969. Over the last decade, the business became a family enterprise. 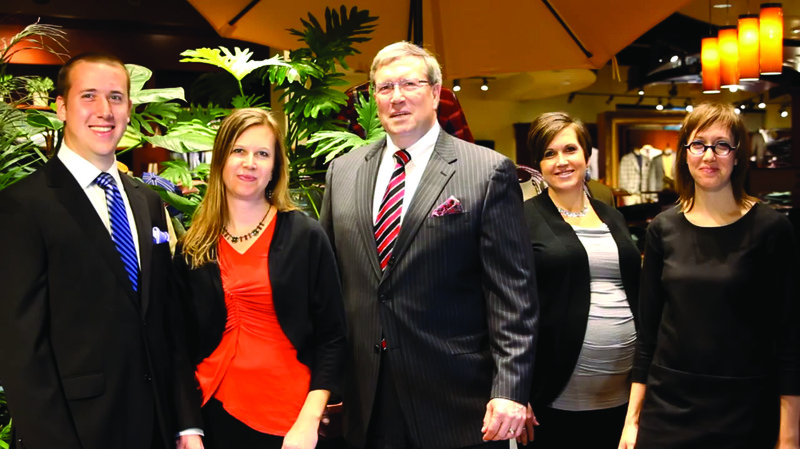 Four of Gordy’s children and a daughter-in-law have joined The Foursome team, using their unique interests and talents to enhance the business. The Foursome started in Wayzata, and now Plymouth is our home. We have grown, downsized, survived a weak economy, and persevered through challenges. Through it all, we continue to keep pace with changing times. Like the little engine that could, cheerfully pressing on over the big hills, we are still a family and business. We remain committed to what matters most to us, namely our customers. We take pride in helping them feel comfortable and confident in the quality clothing we sell. We have always been steadfast about community involvement, so we weren’t surprised when ‘shopping local’ became a trend. We have supported our community since the beginning. We participate by providing employment, volunteering, advertising, and contributing to food shelves, sports teams, clubs, and religious organizations. As a family business, we value knowing and helping people — both our customers and our neighbors. We consider ourselves a rarity in this day-and-age. For people who value knowing where their merchandise is made, appreciate friendly and expert service, and love a good story, The Foursome is your family to shop with. We choose brands that are made in the USA, whenever possible. The pressure to move manufacturing offshore is strong. A competitive economy makes it especially difficult for small companies not to do so. But we have found a few that have stood against the tide. They all exhibit grit, determination, and a commitment to our country. We proudly honor them and their stories with our Made in the USA promotion. Why does it matter? Goods made in the USA use less fossil fuel than those that are imported. The companies that make them are vital to our nation’s economy. They form the backbone of our society, by creating jobs and hope in towns across the United States. It feels good to do what is right. Today, instead of following the trend to move manufacturing offshore, Allen Edmonds invested millions to modernize its US manufacturing facilities. The company employs over 280 employees at their expanding Wisconsin shoe factory. ” Our longevity is also attributable to the company being at its heart, a family business.” Our family at The Foursome can say the same is true for us! We are proud to offer and extensive selection of Allen Edmonds footwear in-store and online. In 2000, successful European designer Adriano Goldschmied joined forces with the California-based Koos Manufacturing, a respected producer of quality jeans. Goldschmied was ready for a U.S. brand, believing that “nothing more than jeans represent the spirit of America”. AG has since become synonymous with great quality, design, and state-of-the-art washes. In the fall of 2004, Adriano and Mr. Ku mutually decided to end their association, with Adriano leaving his namesake company to venture out on his own. Under the direction of Mr. Ku, the AG team has maintained its commitment to the “made in the U.S.A.” label, and is dedicated to the continued development of the brand with the utmost attention to detail and quality. We are proud to offer AG Jeans for men at The Foursome. Bill’s founder discovered a pair of original World War II khakis at an Army surplus store while in college. They were remarkably comfortable, deep pocketed, and built to withstand just about anything. He felt that modern-day khakis paled in comparison, and so set out to save this small but symbolic piece or Americana. The Bill’s Khakis company has been through some recent changes and new ownership, but we are proud to one again offer this authentic American brand at The Foursome! Carrot & Gibbs was founded in Boulder, Colorado, in 1987. Neil Borin, one of the original owners, knows his bows. You will never see a Carrot & Gibbs tie that has been fashioned out of stacked fabric and cut en masse. Carrot & Gibbs bow ties are created from specially selected imported 100% silk fabrics, predominately woven and printed. Each tie is individually cut, sewn and pressed by hand here in the United States. And rather than a metal clasp at the back, you will find mother-of-pearl buttons. Carrot & Gibbs is proud to be associated with this small piece of cloth with its 400-year heritage. The bow tie inspires a staunch loyalty that can only be understood by those independent thinkers who look into the mirror, tie their bows, and go forth as proud members of this civilized minority. Click here for a step by step bow tying guide. At FITSOK, the mission is simple; Give athletes the best in engineered fit and performance. They are committed to offering products that allow everyone to excel. Whether running, biking or training, each FITSOK pushes the boundaries of moisture and temperature management. From the athletic CF2 to the feature rich CX3 and the advanced ISW, the entire FITSOK lineup is designed to keep feet dry, comfortable and cool. Every sock is packed with tech, built right here in the USA. Running isn’t just a sport – it’s a lifestyle. Hardwick Clothes, America’s oldest continuously operated tailored clothing manufacturer, has called Cleveland, Tennessee its home since 1880. Since it’s founding, the company has endured factory fires, economic recessions, two World Wars, inflation and leisure suits. 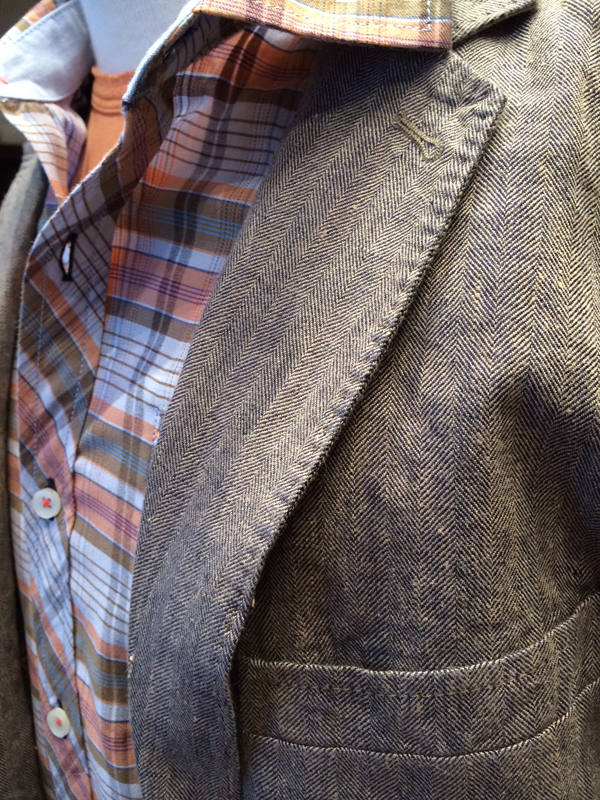 Despite these challenges, Hardwick has continued to provide some of the best garments made in America. We are proud to offer Hardwick sport coats at The Foursome. Hart Schaffner Marx is an American story. In 1887, two immigrant brothers by the names of Harry and Max Hart scraped together just enough money to open up a men’s clothier in downtown Chicago. Through their tireless work, savvy innovation (the first to introduce suits tailored for different body types, zippered trousers and tropical weight wool suits, amongst other things) and an unwavering commitment to dressing men in high-quality clothing produced right here in the USA, the brothers grew their company into one of the largest men’s suit manufacturers in the world. HSM continues in that tradition today, giving well-dressed men of conviction the style and grace they demand in the American-made choice they deserve. With a 120 year heritage, the HMX group is the leading American clothing manufacturer and marketer. There is an actual JZ! Jan Zumbrennen (Richard Jan Zumbrennen) founded JZ Richards 17 years ago. By 1994 when the company was founded, he had over 20 years of experience in the neckwear industry having worked with Bert Politzer, Robert Talbott, and Farrell Reed. Jan’s goal was to incorporate the best components of each of those companies under a single roof, and JZ Richards was born. The company was founded in 1994 in the Zumbrennen living room. In fact, the first JZ Richards Line was swatched on top of the family’s pool table. Then, as now, the company is based in beautiful Boulder Colorado in the foothills of the Rocky Mountains. The Wild Horse Studio, set 7,000 feet above sea level with sweeping mountain views, has been the inspiration for the vast majority of JZ Richards’ designs over the years. The main office “down the mountain” in Boulder proper is filled with long term employees committed to maintaining the high standards that JZ Richards customers have come to expect over the years. J.Z. Richards ties are hand-made in the U.S.A. The quality American craftsmanship that goes into every J.Z. Richards tie results in a durable tie that knots easily, doesn’t slip, and is quality inside and out. Your J.Z. Richards tie always looks great. And so will you. This new and innovative company has turned traditional menswear on its collar. They believe a man on the move shouldn’t require an outfit changed at every stop. These performance fabric dress shirts may make you wonder why you wore cotton shirts for so long. It’s tradition evolved. All Mizzen + Main shirts are cut and sewn right here in the U.S. They are strong believers in having a positive impact on our country and being American-made is core to who we are. The Foursome is pleased to offer customers the Mizzen+Main shirt collection. When a hand-crafted “made to measure” shirt is what you desire, Skip Gambert & Associates is The Foursome’s obvious choice. Since 1992, this American manufacturer has been producing great products with a genuine craft ethos. Take a minute to watch this video of the factory and witness the remarkable care and pride of the workers at Skip Gambert. Founded by New England ski instructors, the company swears by the amazing natural fibers of merino wool. They have worked extensively with their New Zealand sheep growers on the fair treatment of sheep. 90% of all SmartWool socks are knit right here in the U.S.A.
Nearly 50 years ago, Bernhard Brenner came to America as a young knitting engineer from Europe with a singular vision: “To make the finest sweater that can be made.” Amid the scenic bluffs of the Upper Mississippi River Valley at Winona, Minnesota, Mr. Brenner founded Knitcraft Corporation with the belief that Winona’s beautiful countryside and the strong work ethic of its residents would be key to achieving his vision. In a short time, the St. Croix label became synonymous with perfection in craftsmanship and styling and earned its reputation as the world’s highest quality knitwear. Not only is St. Croix American made, it’s Minnesota made! This quality and world-renowned menswear collection is made so close to the Foursome, we consider it local. As a family business, we especially value buying merchandise from our neighbors who we know personally. Shop our large selection of St. Croix items in-store or online. The rich heritage New Orleans possesses makes a perfect setting for Torino Leather’s old world craftsmanship. Torino Leather emerged after Katrina when four partners invested in new equipment and raw materials and started production in early 2006. The business has continued to grow steadily since that time and is now the premiere US manufacturer of fine belts and luxury leather goods. Most of their experienced craftspeople have worked with Torino Leather since its inception and have contributed in a major way to their success and growth. From their headquarters in Honolulu, Tori Richard is a resort lifestyle company. Founded in 1956, Tori Richard, Ltd. is still today a family business driven by an appreciation of unique fabrications and globally inspired prints. The first factory was on Pier 7 in downtown Honolulu. At high tide it was not unusual to see wet floorboards. As the business quickly grew, founder Mort Feldman moved the factory to a Quonset hut on Beretania Street in Honolulu. Over the years, the family business changed and adapted, but stayed true to their Hawaiian inspiration and values. In December of 2008, Tori Richard, Ltd became one of the world’s first solar powered apparel manufacturers and retailers. This unique, $1.1 million photo voltaic system provided their corporate headquarters and warehouses in Honolulu with 94% of all its electricity needs. The Foursome offers Tori Richard shirts for men and big & tall men in-store and online. Since 1905, my family has been committed to our employees, our community, and making fine quality socks just for you” – Bob Chesebro, President. Wigwam Mills, Inc. is proud to knit its socks in Sheboygan, Wisconsin, U.S.A., just for you because we care. We care that thousands of manufacturers in this country sacrifice quality for less-expensive labor in other areas of the world, to increase the bottom line. We care about the environmental, sociological, and financial implications of this policy. Our manufacturing facility is state of the art and getting more “green” all of the time. We have and are working with local utilities to improve our efficiency and limit our carbon footprint. We support wool producers in this country by sourcing our wool almost exclusively from American yarn spinners who buy from American wool growers. And we support domestic yarn spinners whenever possible. For over 100 years, Wigwam has been dedicated to enhancing the lives of our customers. We have done this not just through providing them the finest quality socks, but by providing them with the assurance that their purchase of Wigwam socks supports its reputation of honesty and integrity. Since the company was founded in 1987, the demand for Woodlore cedar products has grown. Their goal is to build a reputation for quality that is as strong as the wood they use. They use kiln-dry lumber to a precise moisture content and carefully control humidity levels throughout the manufacturing process to prevent cracking and warping. Fine sanding gives every surface a silken finish. Such uncompromising standards bring out the lasting beauty of their natural cedar products. At Woodlore, they understand the importance of preserving the environment for future generations. After all, their business depends on natural resources. That is why they practice selective cutting, which allows aromatic cedar to grow faster than it’s harvested. They follow manufacturing techniques designed to waste as little as possible. Even their wood chips, shavings and sawdust get put to good use. Plus, packaging is both recycled and recyclable. All Made in the U.S.A. brands are 20% off at The Foursome May 21-29, 2018. We are closed Memorial Day, Monday May 28th. Have a safe and happy holiday. Why does it matter? Goods made in the USA use less fossil fuel than those that are imported. The companies that make them are vital to our nation’s economy. They form the backbone of our society, by creating jobs and hope in small towns across the United States. It feels good to do what is right. All Made in the U.S.A. brands are 20% off at The Foursome May 22-31, 2017. We are closed Memorial Day, Monday May 29th. Have a safe and happy holiday. Update your professional wardrobe during our semi-annual Tailored Clothing and Custom Event, September 15 – 25. Preview our curated fall 2016 collections from fine brands like Byron, Hart Schaffner Marx, Jack Victor, Ballin, Riviera, Enro, Forsyth of Canada, David Donahue, Allen Edmonds, Cole Haan. Many brands available in big & tall men’s sizes. Expert sales associates and on-site tailors help you build a great wardrobe and get the right fit. ADD ON // St. Croix Knitwear. 20% off when paired with tailored clothing. As your local clothier, our goal is provide an easy shopping experience and a quality assortment of men’s fashions. Meet our team of professionals. Perhaps you are not the organizing type and the thought of “cleaning house” makes you want to fly away to the ocean (if the polar vortex has not already put this idea in your head). Now, in the dead of winter, with spring hopefully around the corner, is a good time to assess your wardrobe and do some rearranging. Getting your closet in order doesn’t have to be painful or take forever. Here are a few tips, tricks, and ideas to inspire a little closet revamp or perhaps complete makeover. I guarantee the outcome of either will be well worth any effort you put in. Not only will the results make your morning routine more pleasant, but the process is sure to reveal items needing to be replaced, tailored, or mended. While sorting through things, you will want to assess the state of your clothes as you go. When you buy quality, timeless clothing like we sell at The Foursome, just because you have had something a few years doesn’t mean you have to toss it. There are ways to fix and update apparel. 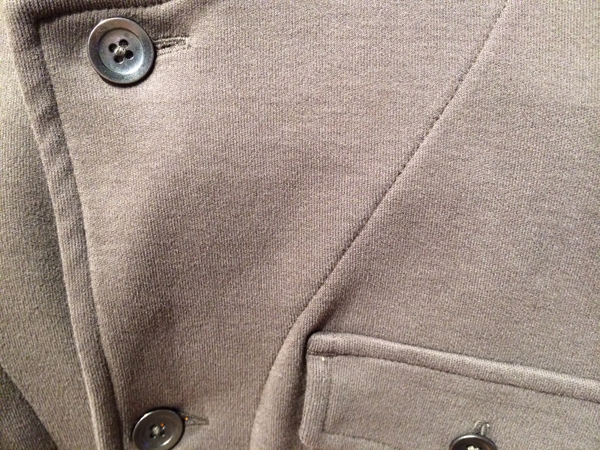 So in “The Foursome Tailor Shop” pile, place items that have missing buttons, minor rips along the seams, etc. Also, suits or button down shirts that need an updated look can have a few inches taken in to give them a current fit and you a modern look. (Just be sure to bring them in clean.) But there does come a time when items need to go. 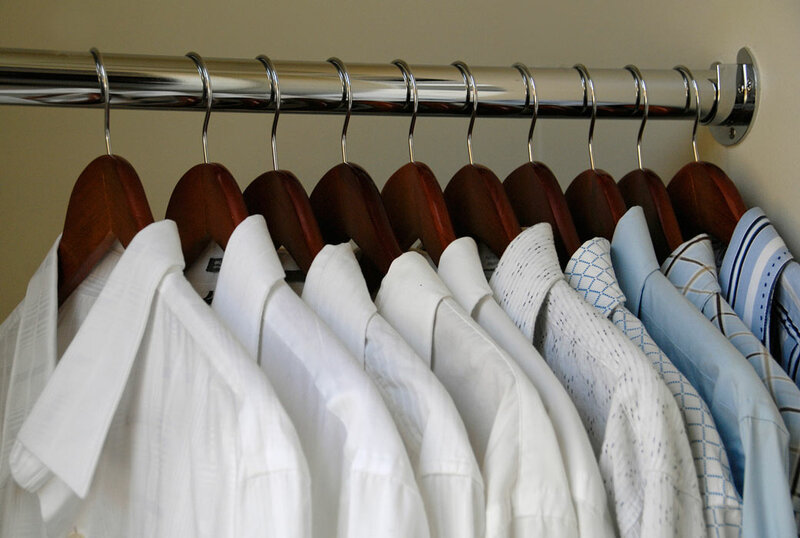 You are sure to find white under shirts and dress shirts with yellowed collars and pit stains that you have had a few too many years. These can go in the “Donation” pile. Just dust off your hands and purchase a new set of basic Enro or Forsyth dress shirts for every-day wear and a few new packs of Jockey undershirts (3pk for $29.50 at The Foursome). While you’re at it, give your underwear and sock drawer a quick overhaul. Throwing out the old and replacing with 7-10 new pairs of socks and underwear will make you feel like a new person. Start around the edges and get rid of things you no longer use or need. (They are often things you wonder how they made it into the house in the first place) If you haven’t used it in the last year, it is a good sign it is time to purge it. Organization Trick: Try this hanger rotation trick for a painless way to weed out your clothes and identify what you actually wear on a regular basis versus what you think you need to keep. Just getting rid of mismatched plastic and wire hangers will make your closet look like a million dollars. 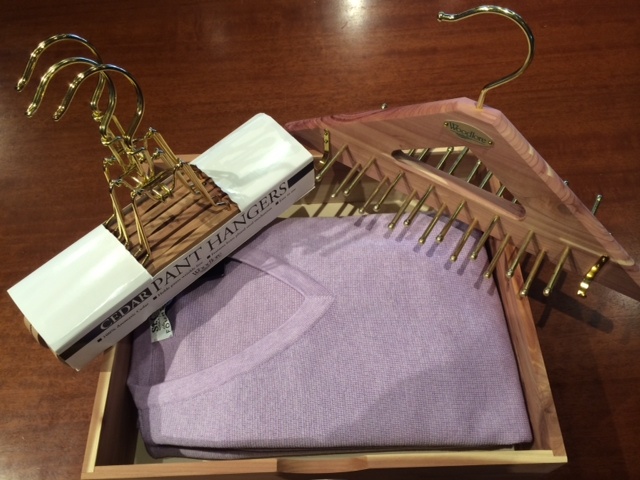 So take the plunge and purchase simple wood hangers for all of your hanging clothes. This alone will help the quality clothes you buy stay and look nice in your closet. Here are few options and price ranges out there. Organizing your clothes by color may seem a bit over the top, especially for some guys, but it is not as hard or time consuming as it may seem. Initially it may take 20 minutes or so to group your blacks, then grays, blues, etc., but once they are hanging in color order maintenance is a breeze. Just putting it back where it goes does not take any extra effort. Especially for smaller closets but to simplify any closet, storing out of season clothing items in a plastic bin will free up a lot of space in your drawers and hanging closet. Storing what you wouldn’t wear anyway helps in selecting what to wear in the morning much more quickly. Sometimes you have a handful of timeless items you just haven’t worn in a while but can’t seem to part with for whatever reason. One idea is to pack a surprise bin, where you store these items out of sight for a while. Then, when your wardrobe feels tired and you want something “new” to throw in the mix, open the surprise bin and see if anything strikes your fancy. What’s left, time for the give-away pile. Depending on the size of the closet, it is often necessary to store things up off the floor. There are many inexpensive over the door hooks out there that can be very handy for hanging things like your leather bag or dry cleaning items. Shoes are one thing easily strewn here and there but check out this attractive over the door shoe organizer to keep pairs together. Need extra hanger space? Check out this nifty over the door hanging rod. An observation while unloading new merchandise onto the shelves this spring is: The material world has expanded in recent years. It seems that every garment was made of intriguing surfaces and carefully produced textiles, the fabric and dyes woven with interest and technique. Making new clothes look vintage or worn is not a new idea, but production processes continually advance, resulting in new merchandise each season. Each brand The Foursome buys brings their own aesthetic and flavor into our store. They are the highest quality we can find. Quality truly matters. It lasts significantly longer than cheap look-a likes, it is noticeable even from a distance, and most importantly is felt by the wearer. Apparel made with fine material and constructed in smaller batches has the ability to offer a unique look. 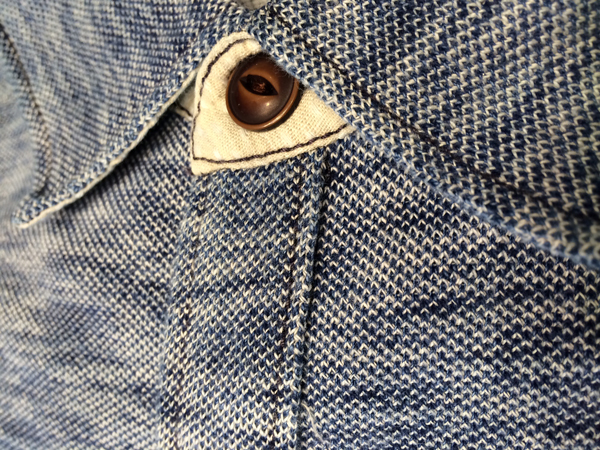 Specialty hardware, fasteners, and buttons add details that affect the overall look of any pant or shirt. The process in which clothing is designed and constructed is complex and involved. One of the most innovative brands in creating a wide variety of textiles within their line is Tommy Bahama. They never tire of inventing new wearable surfaces. Some of their garments arrive already absorbed by the sun. Others have raw edges like their popular Fray Day polo shirt. 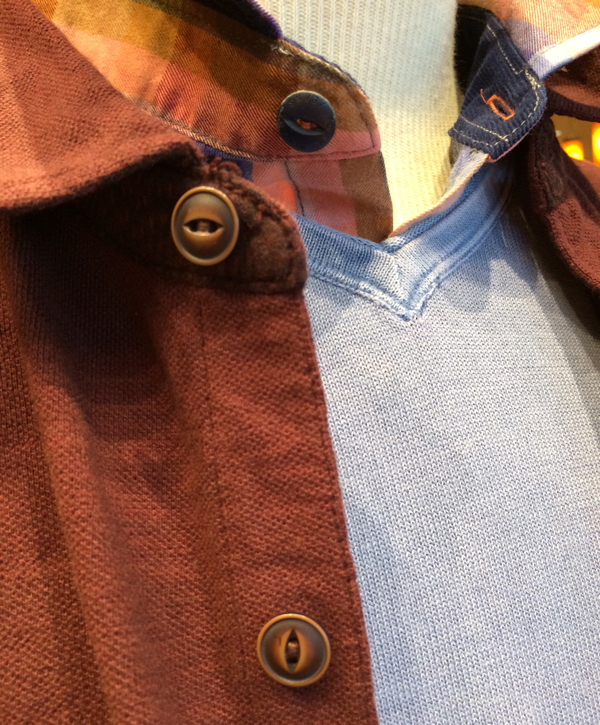 Variation within the dye of a single sweater offers a casual yet sophisticated look. Different blends and weights of fabrics feel different against the skin and drape differently on the body. It is inspiring to see new merchandise this spring that has evolved from only a year ago. Beautiful new color combinations and color palettes to work into your wardrobe. Rustic and interesting textiles designed with style. So take notice. The materials these days are anything but uniform. Below is a beginners list of textile terms. See if you can name a few next time you are in shopping. A special dye used to add color to finished garment. Rather than dying raw fabric before cutting and sewing, dying is done to individual pieces after construction. This can be done uniformly but it is also how they achieve subtle washed out dye along the seams and naturally throughout the garment. Yarn dyed clothing is made by first dying the yarn before weaving and construction. This is where you will notice beautiful subtle variation throughout the entire knit garment. The appearance can vary greatly between how fine the yarn gauge is to what type of yarn and dyes are used. 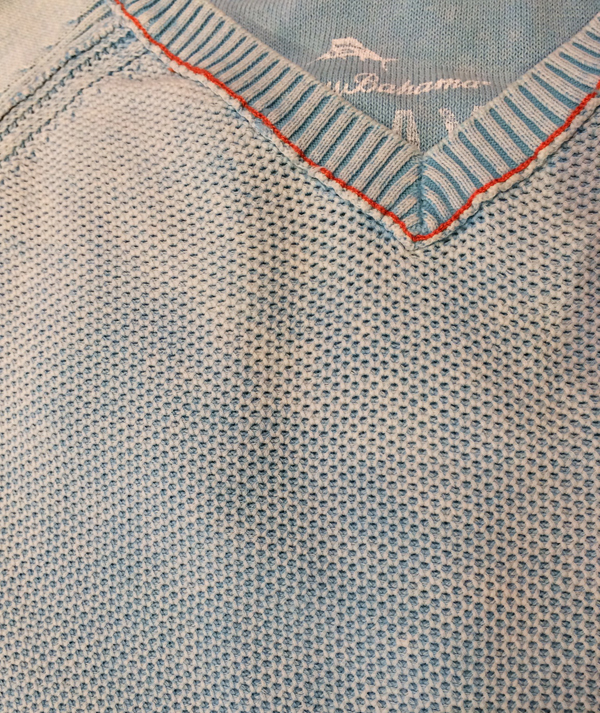 When the stitching along the seams is a different color than the main fabric color. The details in types of stitching and where this contrast stitching is incorporated can completely change the look of the apparel item. 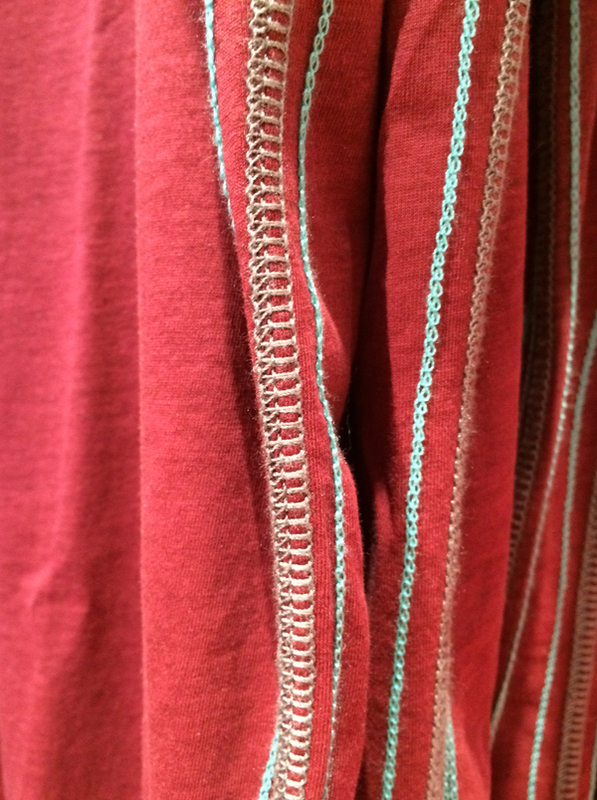 Slubbed or nubby yarn adds intentional texture to fabrics and visual appeal. Machines are set to modify how much slub is present in the weave of a material so designers can implement their desired effect. Brushed, sanded, or chemically treated for extra softness. A sueded cotton t-shirt feels completely different than your basic cotton t-shirt. It has a different weight to it and drapes a little closer to the body. This interesting fabric is most often composed of two distinct fabrics lightly connected by a third binding weft. 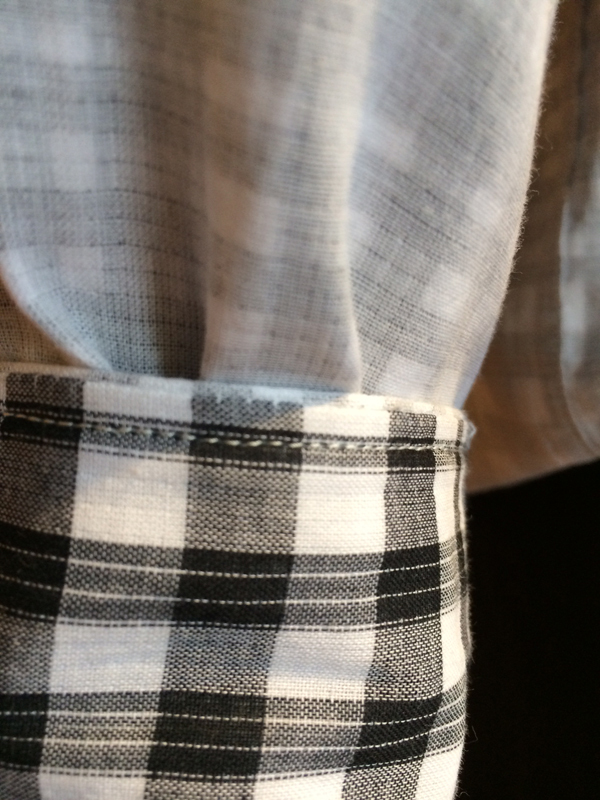 Basically, the exterior and interior fabric of a shirt will look completely different but are one fabric. Winter is tough. The crust and slush and muck has arrived on the terrain, full of “sick germs” for your shoes. Remembering the white salt stains that rimmed my nice leather boots last year, I decided to start researching better winter shoe care. After asking our shoe experts at The Foursome and a little internet browsing, I found a few precautions and simple remedies to safeguard your favorite leathers. 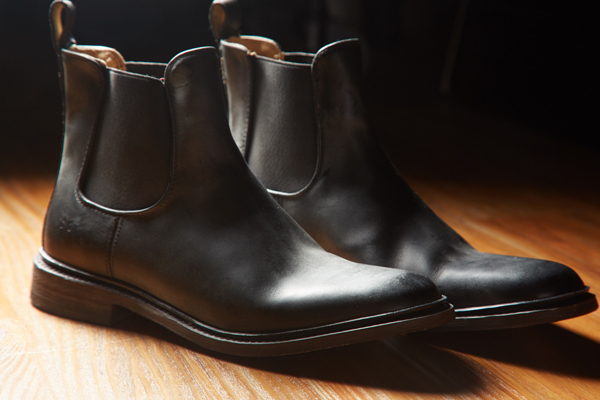 Polish or moisturize your leather shoes and boots to protect them against the elements. At this point in the season, do this ASAP. Think of this step like lotion for your skin…you are less likely to dry out and crack when lotion and potioned up. Though we are all eager to get in the warm house asap, taking the time to brush the wet snow from your shoes could save you a lot of damage. This step enables them to dry out faster which is important in helping your shoes stay healthy. So keep a brush or towel in your entry and get in the habit. We all need a break, and shoes do too. Would you want to work seven days a week? Swapping shoes every day will enable the ones taking a nap to dry out, breathe, and remain durable and flexible for their turn out in the cold. This will only prolong the lifespan of your beloved leather footwear. Just a few wears out in the snow or down an icy sidewalk will make noticeable white rings near the sole of the shoe. Luckily, the recipe for erasing salt lines is simpler than the Cat in the Hat removing the pink ring in the tub. If wiping the salted areas just after you come indoors with a warm damp rag doesn’t do the trick, just mix up a small container with a 1:1 ratio of water and vinegar and gently rub it into the affected areas. Ok, let’s be honest, like bad breath it’s hard to hide foot odor. A more natural approach to sprays and other topical odor treatments are cedar wood shoe trees. They sustain the form, keep the interior dry, and leave a natural cedar scent for you and your loved ones. Visit The Foursome’s leather care expert, Cornelius, at the store on Saturdays from noon – 3 p.m. Wear or bring a pair and receive a free shoe shine. You’ll be amazed how your shoes or boots can look good as new! Available at The Foursome. Some only cost a couple dollars and could save you hundreds. Protects leather and suede from water and oil-based stains. Spray should be applied to new shoes and re-applied as needed throughout the season. Cleans and moisturizes, natural leather. Moisturizes, protects, and cleans natural leather. Naturally cleans and applies shoe cream and polish. Keep your leather shoes in top condition. Shoes remain dry on the inside while leaving a fresh cedar scent. The finest rubber overshoes made. Protects your fine shoes from rain and snow.